You can read my full disclosure statement here. 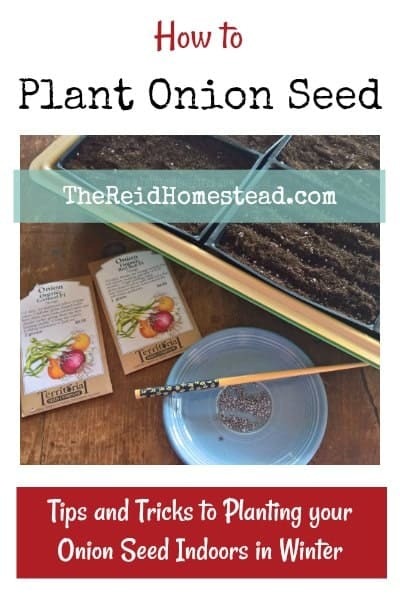 Today I am excited to share with you how I start my onion seed indoors in January! 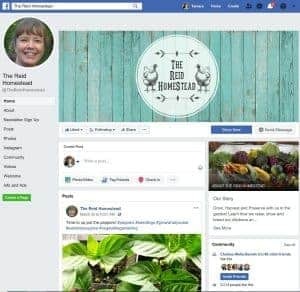 I hope you will pick up some helpful tips and tricks, and learn how we grow enough onions to use for most of the year! If you want to grow enough onions to keep your family supplied for the year, consider growing good storage varieties of onions. Sweet onions sure taste good, but they don’t keep for very long. 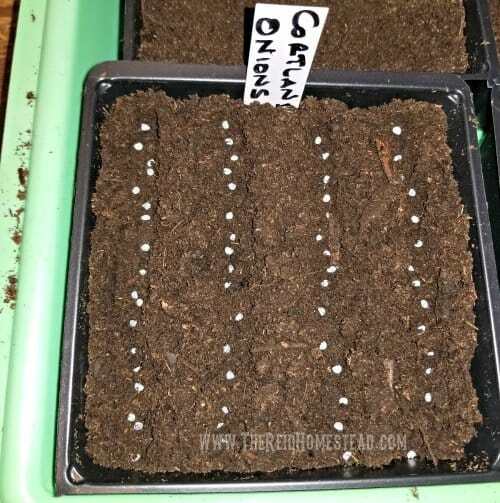 How to Plant Onion Seedlings. 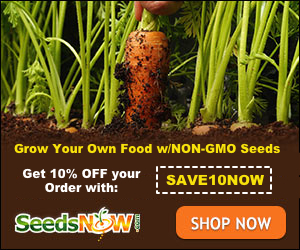 Our favorite Homesteading and Gardening tools in our Amazon Shop! January is the month my fingers get itching to plant onion seed. Luckily there are a few things you can plant by seed as early as January here in the PNW, even earlier in milder parts. They are usually the first thing I plant in the dead of winter. Other things that may be started this month by seed are celery, artichoke, asparagus and hot peppers. I sow most of my seeds using two methods, Winter Sowing and also indoors using your standard seed starting Equipment. 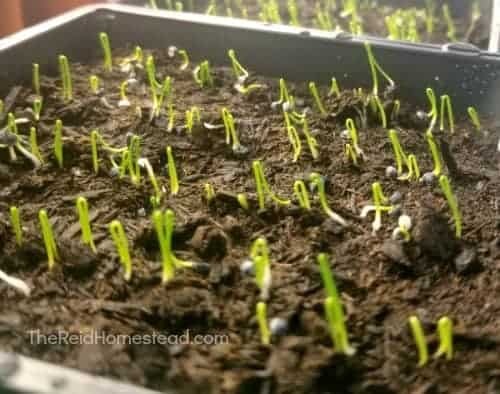 Please see these two article for more information on both methods: Seed Starting 101: Winter Sowing in which I share how I use milk jugs outdoors as mini greenhouses to start seed and my post about Seed Starting Equipment lists more detail about equipment needed to start your seeds indoors. It also covers what type of soil I use for starting seeds. I chose several varieties of onion seed to plant, with my primary focus being on onions that are excellent keeping onions or also called storage onions. These types of onions will last in storage all through winter after harvesting and curing them. Sweet onions like Walla Walla and Vidalia are delish, and I usually grow a small amount for fresh eating. But if you want to keep onions for a long period of time, these are not the best for that. When trying to grow most of our own produce for the year, it is essential to look at varieties of food that keep well. . For this reason, I choose not to start my onions by onion sets. Often onion sets will bolt very early, as they are actually onion that was grown from seed the previous year. There are usually not many varieties to choose from when using onion sets either. 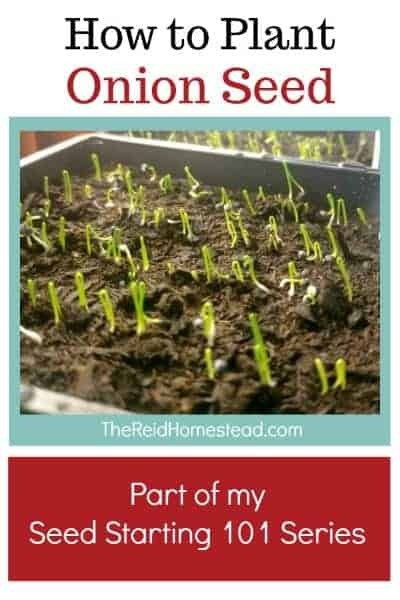 By planting from seed, you can plant any varieties of onions including leeks, shallots or heirloom varieties using the process I outline below. 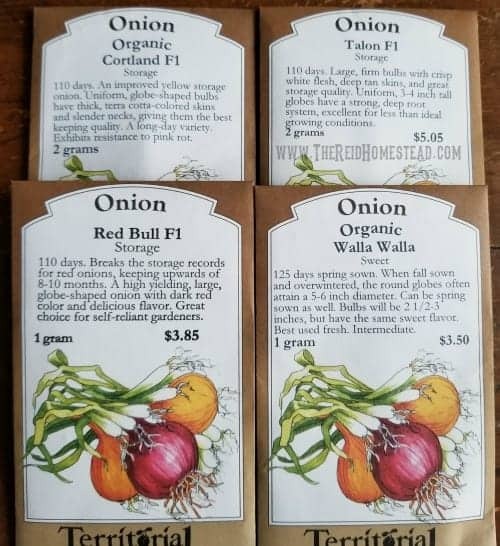 This year for storage onions, I will be growing Talon F1, Cortland F1 and Red Bull F1. I have grown all of these before and they have all grown well for me. The Red Bull kept the longest in storage before sprouting, so I always grow a lot of it, even though we prefer the yellow onions. Some other well know varities of storage aka keeping onions, are Copra and Patterson. The Walla Walla’s are a sweet onion, and will only be used for fresh eating. Onion seeds are one type of seed that do not store well. I learned that the hard way one year. I planted 2 yr old left over seed, and had less than 10% germinate. Now I always buy fresh onion seed as a result. So be sure you are using fresh seed. If in doubt how old the seed is, buy new. I would not get onion seed from a seed swap for this reason. When you plant onion seed, be sure you are choosing the correct one’s for your area. There are long day onions which do best in the northern half of the states and need daylight for longer than 12 hours a day. Then there are short day onions which do better in the southern half of the states and require less sunlight hours during the day. 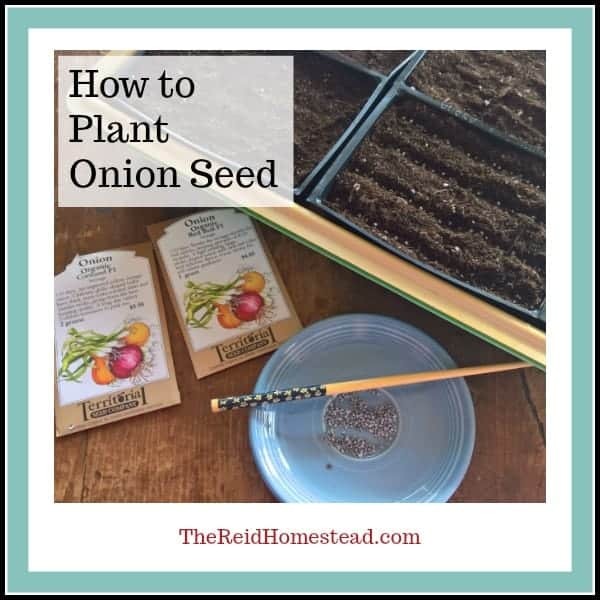 For planting onion seed, I like to use seed tray inserts that are approximately 4″ x 6″ or 5″x5″. Draw 4 furrows about a 1/2″ deep the length of the tray. Plant the onion seed down the line, maybe 1 seed every quarter inch or so. I use a chop stick to help place them. I plant approximately 20 or sow seeds in each row. Than gently cover the seed with soil and press down all the soil in the tray firmly with your palm and fingers. Spray with water, enough water to get the top inch or so of soil damp. Place in a standard size plant flat without drainage holes. When the flat is full of seed trays, cover with a plastic humidity dome or saran wrap. These would probably germinate fine without a heating mat as the ideal germination soil temperature is 55-75 degrees. But I have seed mats on hand so I place the flat on the heat mat when done. If you don’t have a heat mat, try placing the flat in a warm area such as on top of the refrigerator. Watch that the soil doesn’t dry out, and spray when necessary to keep the seed in a damp soil medium. Once the majority of the seeds have germinated, it is safe to take the plastic dome lid off. This is only used to ensure that the soil stays damp for germination. From this point onward, water from the bottom, by filling the flat about halfway with water. Onions are heavy feeders, so I like to feed them with Fish Emulsion Fertilizer in the water, using a highly diluted amount of 1-2 TBSN’s per gallon of water. It is a good idea to place a gentle oscillating fan pointed at the seed starts. This helps prevent mold and fungus from growing on the top of the soil which can harm the plants. It also helps to create a stronger stem on the plant. At this point, they can also be taken off the heat mat if you are using one. Onions don’t mind the cold, and it will free up your heat mat for growing another crop that needs it like tomatoes or peppers. Ideally the plants should also be under grow lights, placed about an 1″ above the plants, raising the light as needed to stay close to the tops of the plants. I keep them under the grow lights for the first few weeks, and then if you live in a mild enough climate like I do, they can move outside in a sunny sheltered area if warm enough. Just watch the weather and bring them in if it gets to freezing or below. As your onions starts grow, they may get long and scraggily. It is perfectly ok to give them a “haircut” to neaten them up. I trim them down to 2-3″ high. Trim them pretty regularly, every few days or at least once a week. When the plants are flopping over on top of themselves, they don’t get as much air circulation which is unhealthy for them. One of my onion harvests, drying out for the afternoon beginning the curing process. Keep watering, feeding and trimming them until you are ready to plant out in the garden. This is usually around April 1st or so here in the PNW. Ideally they should be as thick as a pencil, but I have planted them when thinner. Ideally they should also have their third “leaf” in. If it is going to be really wet out, I suggest waiting as the smaller plants may rot if it is too wet out. Also, be sure to harden the plants off over a week or so, as they slowly need to adjust to living outside. Putting them straight in the garden without hardening them off, will put them into shock which is not good. See my article on How to Harden Off Your Seedlings. 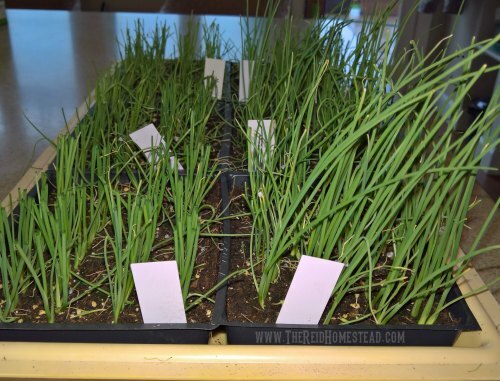 Don’t forget to consider other onion plant family varieties when you plant onion seed. You could also start leeks, chives, white onions, spanish onions, or choose from a vast assortment of heirloom onions. Which onions will you be growing? Happy planting! 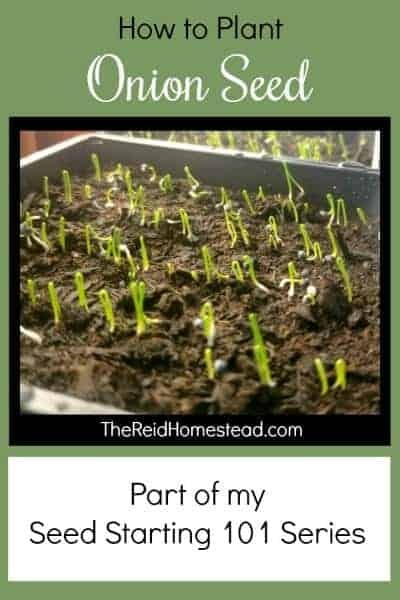 Please save my “Seed Starting 101- How to Plant Onion Seed Indoors in Winter” article to your favorite gardening board on Pinterest! 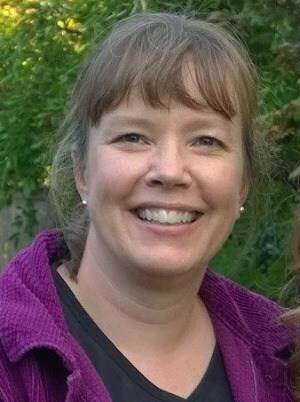 Hi Tamara, great looking blog! I’ll definitely be following, I love what you’ve done with your place. Thanks for sharing your knowledge and experience. Hi Tamara! My name is Breezy and I live in Anchorage, Alaska. I’m very excited to learn about your winter sowing technique for perennials! This article about starting onions from seed is so well laid out. It makes me feel like even I could be successful at it. I try to grow vegetables every year but I was, unfortunately, not blessed with a green thumb. The only things I’m decent at growing are flowers. I really need someone to teach me so I’m very excited about your blog. Last year I lost all my pepper plants, that had started to bloom beautifully so it gave me hope, to aphids that ate every single one of said blooms. I did get about 10 or so tomatoes even though the plants were riddled with blight because we had way more rain than usual. 10-12 tomatoes is pretty pathetic after all the nurturing and work I put into those plants. Don’t even get me started on my mouse-melon endeavor. I am bound and determined to grow enough vegetables to be able to feed my family and to put up for the winter. Someday I will get it right. Hi Breezy! So glad you found my site! Please feel free to ask any questions you have along the way. My goal is to help people here, so I love questions!!! Today was errand day and clean house day after along weekend away, but I am hoping to have my winter sowing post up tomorrow, followed by a post soon on how I start my tomato and pepper seeds. 🙂 Thanks so much for reaching out and saying hello!